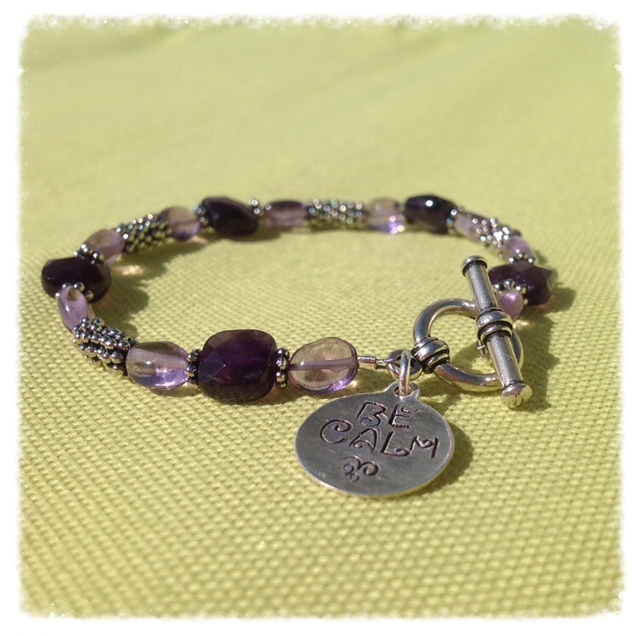 Amethyst "BE CALM" bracelet - 7.25"
Amethyst is said to be a protective stone as well as induce a sense of calmness and security. 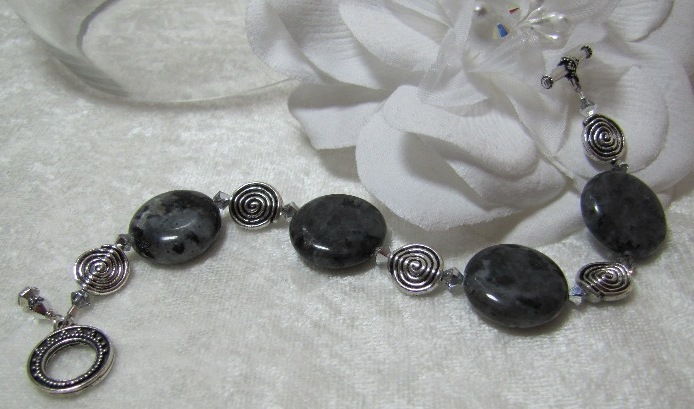 This stone is known for the treatment of insomnia as well as helps reduce stress. The small to medium length bracelet features 8mm dark purple square faceted amethyst beads mixed with oval light amethyst. 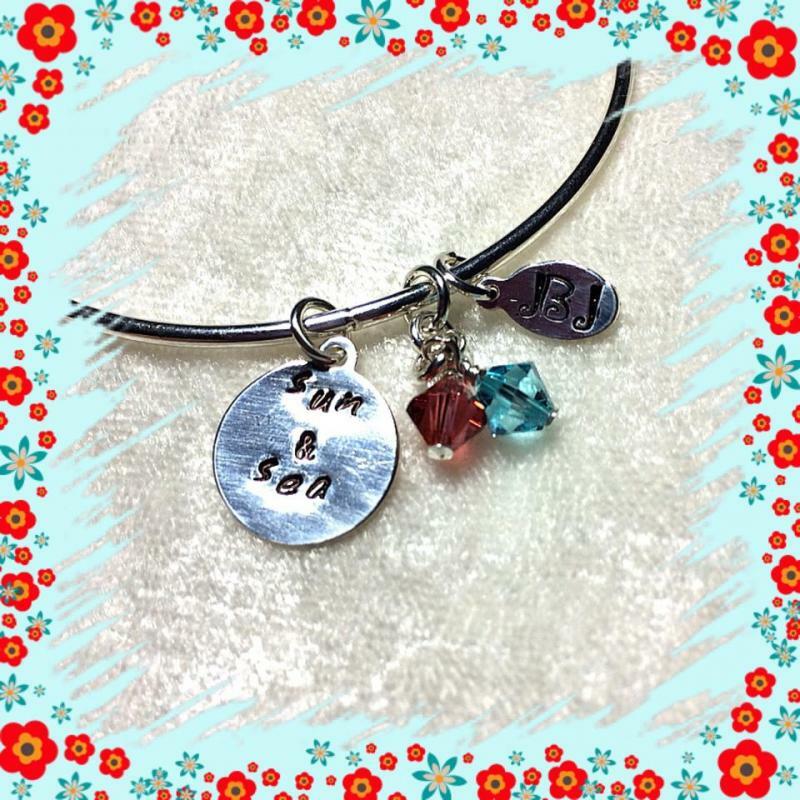 The spacers, clasp, and charms are made of rhodium plated pewter. This light weight elegant bracelet measures almost 8" in length however because of the thickness of the pewter beads it is more of a medium sized fit. 4mm Czech glass is used to highlight the gorgeous rhodium plated pewter beads and offers a little sparkle with the AB finish. 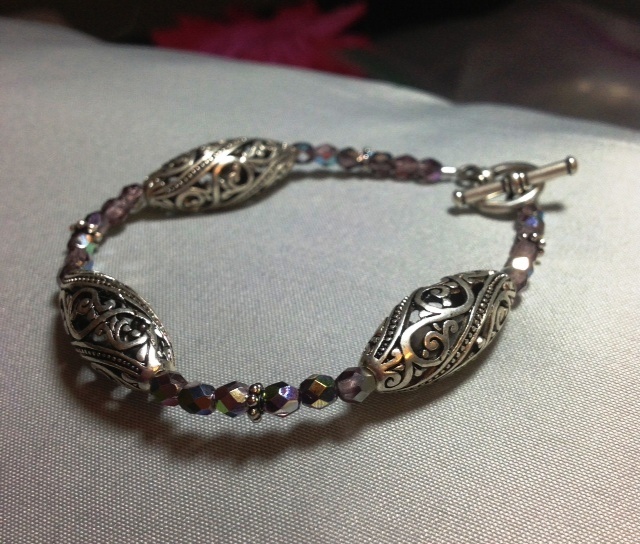 Swarovski and Swirl bracelet - 7.5"
This medium sized bracelet is made with silver-plated sqares spacers with a fun swirl design, Swarovski crystals, and rhodium plated pewter. The faceted Swarovski crystals are 8mm in size and are a beutiful light green with goldish hues - perfect for fall! 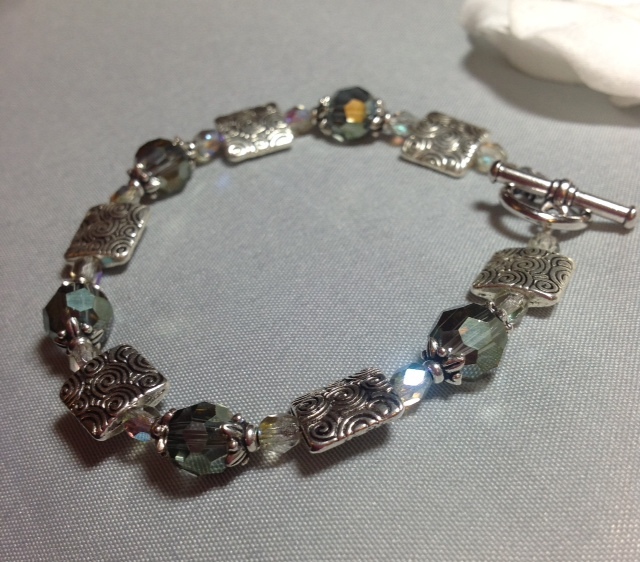 Labradorite and silver-plated bracelet with Swarovski accents. Pewter toggle clasp and charm. 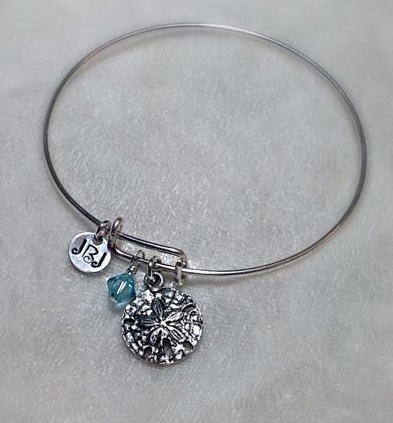 New from Jewels by Jules are bangle bracelets! 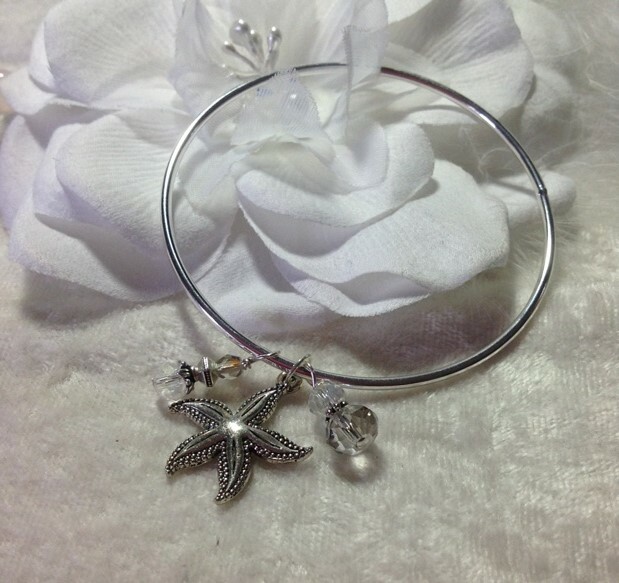 This medium adult sized sterling silver bangle features a pewter 1-sided starfish and Swarovski crystal charms. 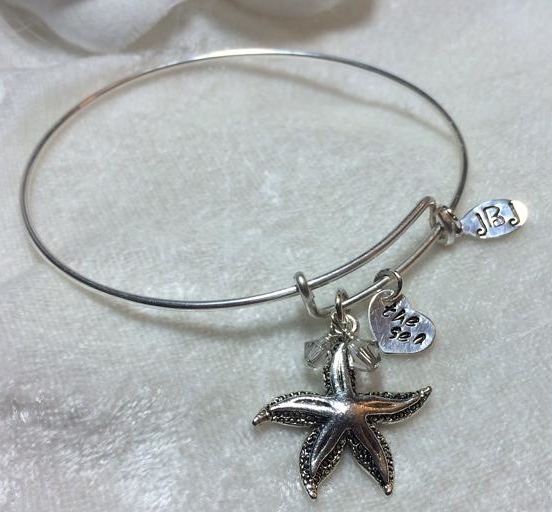 This gorgeous silver-filled adjustable bangle features a pewter one-sided sand dollar and a Swarovski crystal color of your choice. Simply click on the option to add a note to the seller before checking out of PayPal and add your color choice there.